These families were in dire need of a place to hold school and Sunday school as soon as they could get a cover over their heads. Their only schooling was carried on in the homes by parents or older members of the family. The voters met in the Erwin Gorton home April, 1880, following a notice from County Superintendent C.R. Westcott to form School District #13. At this meeting the first school board was elected: John C. Cole, Dave Patterson, and E.J. Gorton. Mr. Gorton offered land from his timber claim to be used for school purposes and the offer was gladly accepted. It was also voted at this meeting to charge out of district pupils $1 each month in advance. They voted to build a structure 16 by 16 feet by eight feet high, cost was to be $86. Later paper and siding were put on and a cover over the door. Typical of school at this time were the two terms., one in the spring and the other in the fall. The lunches were carried in syrup pails and usually the school room was hard to heat; the teacher was the janitor plus all her other duties. One fall they even had to borrow a stove. In 1884 ten double seats and a teacher's desk were purchased. In 1888 they bought a new stove for $20. Minutes show that the board authorized a salary of $5 more per month for a man teacher, than a woman teacher. At one time the treasurer left and took the money with him ($12.50). It cost $3.50 to have the officer collect it. There was much discussion in the late 80's to build a new and larger school. At that time Ann Cole was chairman of the board (she was the one and only woman to be on the school board, ever). They voted to bond for $500. One acre of land was bought from Wm. Keeler for $20 on the northwest corner of the farm now owned by Mrs. Irving Heaton. The new school was 18 by 24 and ten feet high, cost $398. It opened in September, 1901. In 1914 the district was divided, District #42, north and west was built. The coal shed from the first school was moved and joined to the east end of the new building and the old building was sold to Harley Cole, where the Charles Woolerys now live. Sunday school was held in the school until Antelope Valley Methodist Church was built. P.T.A. was started when Mary Harkins Gordon taught. Mrs. Wells Cole was the first president. Olive Kluckman Kenyon was the first teacher to hold a First Grade Certificate, in 1926. Some of the board members include J.C. Cole, his son Harley, his grandson Wells; E.G. Sherburne, his son Arthur; William Goos, his grandson, Loren; and C.D. Limberg, and his son, Milton. There were but four pupils in 1958, with Dorothy Jensen as teacher. In May 1963 the district consolidated with Grant-Deuel at Revillo. The south half of the district consolidated with Gary. An auction was held, books were sold, even the large bell from the top of the school house. Willie Phillips purchased the school. Thus 77 years of learning in District # 13 came to an end. During that time there were 77 teachers. 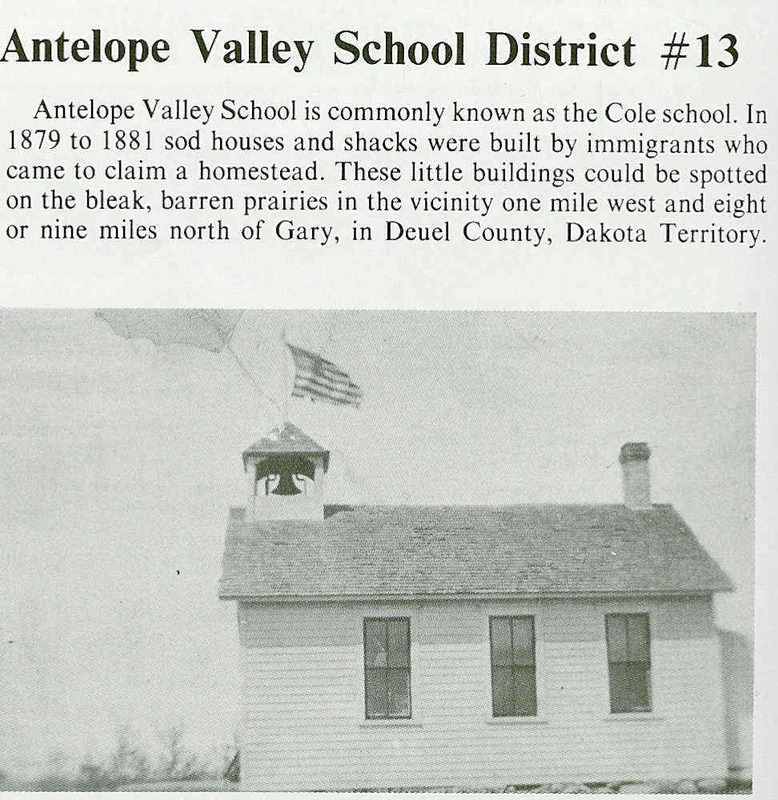 It is believed to be the first rural school in Deuel County in 1880. It is of interest to note that there were four generations of the Cole family who completed their grade school education here. Three of them served on the school board. Bertha Heaton-Cole (Mrs. Wells Cole) also taught school in # 13. Students of high school level went to Marietta, Minn., until 1953 when the law was enforced ending South Dakota students going out of state, so some had to go to Revillo and others to Gary. In 1963 the Grant-Deuel District was formed and these students had to go to Revillo. When the District 13 school was closed an auction was held of the schoolhouse and contents. The building was bought by Willie Phillips and moved to what was known as the J. Schroeder farm, where part of it still stand. In the 77 years as an area of learning, 60 teachers and 35 board members served here. Gone but not forgotten is District 13. There were some bad days but many wonderful and exciting ones too.